Yeovil Town boss Darren Way says the Cobblers going 21 matches unbeaten in Sky Bet League Two is a ‘massive achievement’ - but it is a run he is challenging his players to end at Huish Park on Saturday. Way has overseen a superb recovery at the Glovers, steering them away from the bottom of the table in mid-December to be sitting safe in 19th place as they prepare to host the league two champions. 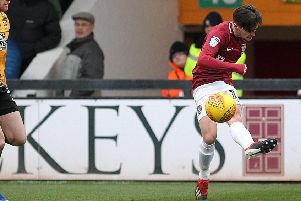 He is full of praise for the job that Chris Wilder has done at Sixfields this season, but is relishing the chance to see exactly how far his players have come under his leadership. “This game is going to be a good challenge for us, and can set a marker for where we are,” said Way, who took the top job at Yeovil following Paul Sturrock’s sacking at the end of November, which came after Yeovil’s 2-0 defeat at Northampton. “On Saturday I expect to come up against a tough team, a tough team that scores goals. The job that Chris Wilder has done there is an amazing achievement, from where they were. “You talk about clubs dealing with adversity, and it has not been easy for Northampton. “There have been times when the players have not been paid, and Chris has kept his head down, he has worked hard and kept his focus within the group, and he has got some good results and got the team promoted. “We know it is going to be a difficult task, but I want the players to be able to relish that challenge. Yeovil are expected to include former Cobblers midfielder Ben Tozer in their line-up on Saturday, while much-travelled striker Leroy Lita is set to lead the line.